I see this question all the time. All the time, in forums, comments on videos, and from people in audiences. I think the question is ridiculous on many levels, and I’ve got a bunch of reasons why, but allow me to explain them here. Before I do, however, I want you to understand that I believe that we human beings are indeed messing up the environment. We’re wiping out species faster than any natural disaster in the history of planet Earth. We’re performing a dangerous experiment on the climate of the planet, increasing temperatures worldwide, with devastating consequences, for both ecosystems and human civilization. Unless we get this under control, and there’s no reason to believe we will, we’re going to raise temperatures to levels unseen in millions of years. There are islands of plastic garbage in the oceans, collected into huge toxic rafts by the currents. Colonies of bees are dying through pesticides and habitat loss. We’re even polluting the space around the Earth with debris that might tear apart future space missions. I believe the science, and the science says we’re making a mess. The first thing is that this whole question is a false dilemma fallacy. Why do we have to choose between space exploration and saving the planet? Why can’t we do both? The world spent nearly $750 billion on cigarettes in 2014. NASA’s total budget is less than $20 billion, and Elon Musk thinks he can start sending colonists to Mars for less than $10 billion. How about the whole world stops smoking, and we spend $20 billion on colonizing Mars and the other $730 billion on renewable fuels and cleaning up our negative impact on the environment, reducing poverty and giving people access to clean water? Americans spend $27 billion on takeout pizza. Don’t get me wrong, pizza’s great, but I’d be willing to forego pizza if it meant a vibrant and healthy industry of space exploration. Gambling, lawn care, hood ornaments, weapons of war. Humans spend a lot of money on a lot of things that could be redirected towards both space exploration and reducing our environmental impact. Number two, it might turn out that space exploration is the best way to save the Earth. I totally agree with Blue Origin’s Jeff Bezos when he says that we already know that Earth is the best place in the Solar System. Let’s keep it that way. Mars might be a fascinating place to visit and an adventure to colonize, but I want to swim in rivers, climb mountains, walk in forests, watch birds, sail in the ocean. But the way we’re using up the natural environment will take away from all that. As Bezos says, we should move all the heavy industry off Earth and up into space. 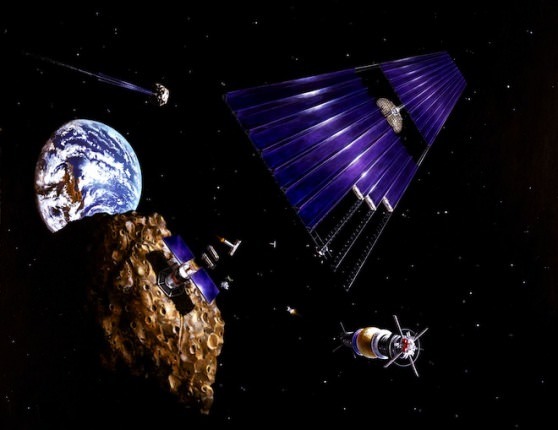 Use solar collectors to gather power, mine asteroids for their raw materials. Keep Earth as pristine as possible. We won’t know how to do that unless we actually go into space and learn how to survive and run that industry, from space. Number three, it might be that we’ve already crossed the point of no return. There’s a great science fiction story by Spider Robinson called “In the Olden Days”. It’s about how modern society turned its back on technology, and lost the ability to ever recover. Humanity used up the entire technology ladder that nature put in front of us; the chunks of iron just sitting on the ground, the oil bubbling out of the Earth, the coal that was easily accessible. Now it takes an offshore drilling rig to get at the oil. These resources took the Earth millions and even billions of years to accumulate for us to use, and transcend. When the cockroaches evolve intelligence and opposable thumbs, they won’t have those easily accessible resources to jumpstart their own space exploration program. Number four, as Elon Musk says, we have to protect the cradle of consciousness. Until we find proof otherwise, we have to assume that the Earth is the only place in the Universe that evolved intelligent life. And until the alien overlords show up and say, “don’t worry humans, we’ve got this,” we have to assume that the responsibility for seeding the life with intelligence rests on us. And we’re one asteroid strike or nuclear apocalypse away from snuffing that out. I don’t entirely agree that Mars is the best place to do it, but we should at least have another party going on somewhere. And number five, it’ll be fun. Humans need adventure. We need great challenges to push us to become the best versions of ourselves. We climb mountains because they’re there. Ask anyone who’s built their own house or tried their hand at homesteading. It’s a tremendous amount of work, but it’s also rewarding in ways that buying stuff just isn’t. The next time someone uses that argument on you, I hope this gives you some ammunition. Phew, now I’ll get off my soapbox. Next week, I’m sure we’ll return to poop jokes, obscure science fiction references with a smattering of space science. The ‘Alien Overlords’ are already here… They are busy diddling with our culture(s) in such a way as to enhance our self destructive tendencies. (Hey Mr. Trump!) Since we’ve already dug up and processed much of the near surface metals all they have to do is hang out long enough awaiting our inevitable self destruction. (Preprogrammmed genetic coding) Then they simply land and collect all the metals in cars, buildings, ships, planes, computers and etc. No war of conquest. No slave laborers revolting. And What a haul! Talk about cheap labor and material costs… LOL… maybe? that explains a lots of things…. Dalia Grybauskait?, Angela Merkel, and other European leaders are honest, competent, and polite. At first it looks like a a top down strategy, but then there is the Philippines. I’d want to add number six: if we learn how to build a space colony, we’ll also have to learn to be sustainable. Long term it’s far cheaper to reuse resources than to dig up new and produce waste. I’ve heard the argument that all humans should be provided for before using any resources to explore outer space. If we use this criterion to get on with space exploration, that will mean never exploring space, because the continuing exponential growth of the human population on a limited earth will ensure this never happens. The argument that convinced me came from Elon Musk, albeit this is how I remember it. Given the risks faced by our species on planet Earth, whether environmental or anthropomorphic, it is a wise move to establish an alternate colony outside Earth as an insurance against extinction. It is a bold idea and rather typical of our fierce determination to survive. Knowing the staggering vastness of space, could we ever as a species forego the imperative to explore this realm, hopefully for millions of years to come? I don’t think so. All forms of life cling to it with staggering tenacity, from a twisted tree in a desert to bacteria, it is the very nature of life itself.